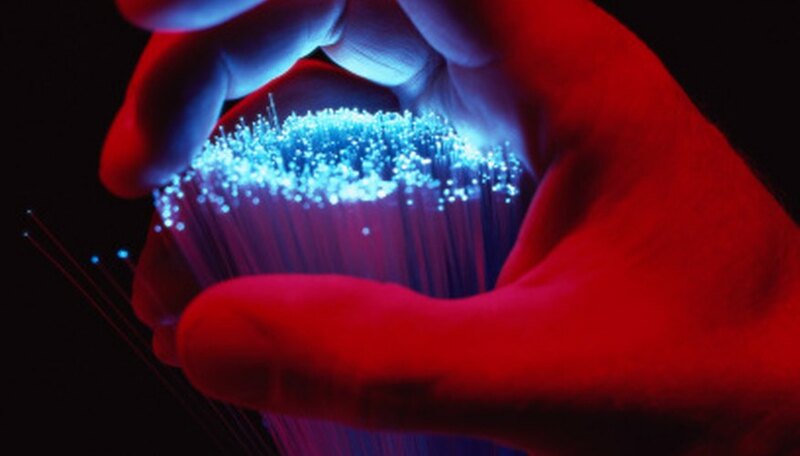 An optical fiber is a strand of pure glass which has a hollow reflective core. Optical fibers are used in many places, but you are likely to be more familiar with their use as a decorative light feature. Most fiber optic lighting is made from many strands that all connect to a light bulb unit. The bulb focuses the light into the strands, where it travels until it reaches the ends where the light glows. There is only one item that can go wrong with fiber optic lighting; the light bulb, so to fix your lighting you need to replace the light bulb. Disconnect the power supply by removing the plug from the electrical socket. If it’s battery operated, there’s no need to disconnect the power supply. Open the light bulb unit’s access panel on the base of the unit, or remove the top of the light unit where the fiber-optic strands connect. The panel may be held in place with screws. If the panel has clips open the clips and lift the cover. Sometimes the panel needs to be rotated counter-clockwise to release. Remove the light bulb from the light bulb holder using your fingers. The bulb usually needs to be turned counter-clockwise. Put a replacement bulb into the light bulb holder. Screw it in place using your fingers. Ensure the light bulb is the same wattage as the one you just removed. Replace the panel on the light bulb unit using the same method as you did to remove it. Insert the plug into the electrical socket, if appropriate. Turn on your fiber optic lighting. James Stevens has been writing articles for market research companies in the U.K. since 1990. He has written various country profiles for inclusion in comprehensive market reports including Vision One Research and Investzoom Market Research. Stevens holds a General Certificate of Education from Chelmsford College of Further Education.